December Holiday Special from the band! – Purchase a ticket for We Banjo 3 in the month of December and you’ll receive an exclusive limited edition autographed poster from the band! One of the best live acts to come out of Ireland in recent years is the multi-awarded winning We Banjo 3. With a 7 time all Ireland banjo champ, a 4 time banjo champ, and another member who is an all Ireland champ on both fiddle and Bodhran, and with a passionate lead vocalist like a young Springsteen adopted by the Chieftans, the result is truly unforgettable. On both sides of the Atlantic the word is out about this group. WB3 performed at the “Friends of Ireland” luncheon on Capital Hill attended by House Speaker Paul Ryan, One of the best live acts to come out of Ireland in recent years is the multi-awarded winning We Banjo 3. 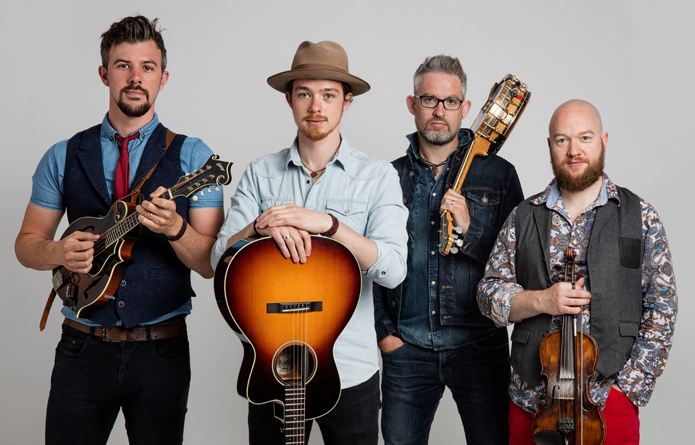 With a 7 time all Ireland banjo champ, a 4 time banjo champ, and another member who is an all Ireland champ on both fiddle and Bodhran, and boasting superb 4 part harmonies as well, they have not surprisingly taken the North American Celtic and Bluegrass worlds by storm. WB3 has headlined virtually every major US Celtic fest for several years in a row. In ’17 and ’18 they rapidly gained favor in the Bluegrass and Americana world as evidenced by their return invites to Merlefest, ROMP Fest, Sisters Folk Fest, Old Settlers Fest, Four Corners Fest and others. With their latest release, “Haven” (July 2018) reaching not only the top 3 of the Billboard World Music chart, but incredibly achieving #1 album on the Bluegrass chart, ahead of the likes of Punch Brothers and Old Crow Medicine show, they are already seeing offers for some prestigious mainstream festivals in 2019. Special Guests Crikwater will join!